"Fill your life with experiences, not things. Have stories to tell, not stuff to show"
Today, we are scheduled to take the guided snorkeling activity cos most of my friends couldn’t swim. 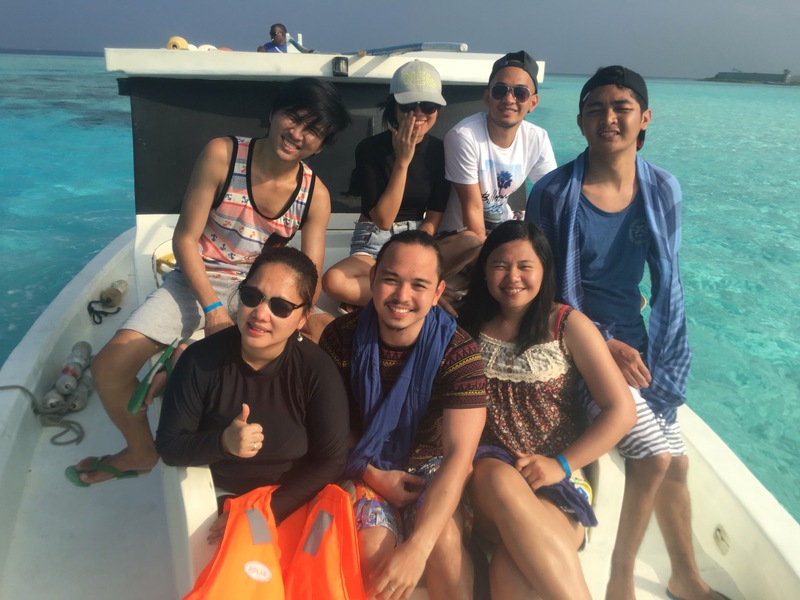 Then at 10am we’ll take the Half day spa activity which includes 3 spot snorkeling (Biyadhoo Reef, Turtle Reef and Banana Reef, which are about 20m deep), Dolphin Cruise, Lunch at Sandbank and of course, 1 hour full body massage. I am very much excited to go to the turtle reef cos we’ll get to swim with them! SWIM WITH THE TURTLES! This is DEFINITELY included in my bucket list! Back in the Philippines, I only had the chance to touch them in zoo and I was able to carry a baby turtle in Morong Bataan during one of our family excursion. But today, I’ll be able to swim with them! yay! Fast forward—> I haven’t take any pictures during breakfast. It took 15 minutes for us to reach our destination. The snorkeling site is just like a big swimming pool because of its crystal clear water. Here are some of the snapshot during one of my dive. Your not-so-little mermaid. Hahaha! After almost an hour, most of my friends were back on the boat. It turned out that the seawater penetrated the other GoPro camera, and Toms and Kuya Derek were worried that they didn’t enjoy the rest our stay. On our way back to the hotel, others are in doubt whether if we would still avail the Half day spa activity because of the 3-spot snorkeling. The guide informed us that we will be swimming in 15-20 meters deep open water with pretty strong waves later, and that it’ll be difficult for the non-swimmers. (Only the three of us -me, Nomarie and Cho- can swim) Unfortunately, majority in our group decided not to join the activity. 😦 The guide advised the non-swimmers not to go, and told the 3 of us that we can still go with the activity, they can arrange to let us join other groups. 😦 I got disappointed that time, my dream of swimming with the turtles suddenly become impossible and I don’t want to risk everyone’s safety just to tick this out of my bucket list. I just accepted the fact that I wont be able to swim with them… for now. The hotel also offered cake because its Chinese new year! Around lunch time, we went back to our rooms to wash up and I just noticed I have bruises in my hand and leg! We rest for a while then left the hotel to have late lunch. We roamed around the island and came across this one restaurant called Sunset View restaurant. We ate outside, along the beach and we just waited more than an hour, yes you read it right, MORE THAN A FREAKIN’ HOUR. When they served the food, it’s as cold as ice (exaggerating, haha! ), not that we’re expecting something, but normally when you dine out, the food served should be hot, right? And the taste looked like they cooked the food the day before we order it! hahah! Not that I’m saying this to make a bad impression in the restaurants in Maafushi, but most of the restaurants we’ve tried also have long serving time, we just couldn’t understand why. coldest fried mixed veggie ever! After that unfortunate experience, we decided to spend the rest of the day at the beach. On our way home, we searched for good place to eat dinner, better than what we had on lunch. Since it’s Chinese new year, most of the hotels offer buffet dinner. Yay! And we didn’t fail to find some cheaper yet better offers! We decided to eat at Arena Beach Hotel cos we meet some Filipino staffs who offered discounts! yaaayy! So we immediately returned to the hotel to wash up and around 8:00 in the evening we went back to the Arena Hotel. They offered many dishes! From salads, appetizers, pasta, beef and chicken dishes, and desserts! They also had special friend rice which is quite good! It was the best dinner for me so far, just for around 15 dollars for the best food and good music, definitely worth it! 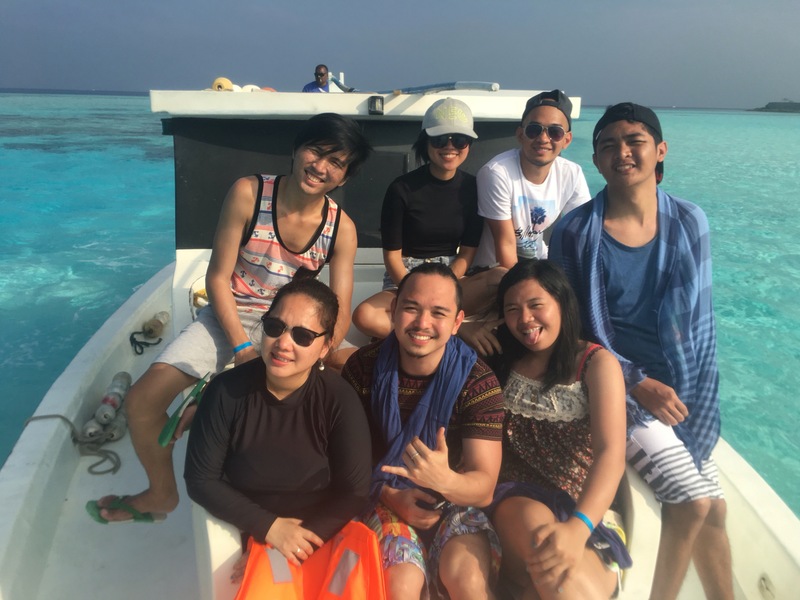 By the way, our basic snorkeling early in the morning is free of charge, it is one of their compensation for the inconvenience caused during our first night. Been to | Singapore | Malaysia | HCMC Vietnam | Maldives | Hong Kong | Macau | Phuket, Thailand | Melbourne, Australia | Bangkok, Thailand | South Korea and counting! Tourist for a day! Ramen, coffee in one of the oldest coffee shop in sg and Museum tour with friends!